For the first post in the "52 Weeks to Start a Startup" experiment, I thought I'd answer the most basic question. What is a startup? I figured I'd start off with a quote from one of my favorite thought leaders in this area, Paul Graham. Let's break it down. The most important word in that definition is the word "growth", and you need to understand why. In the ecosystem that is "startups," it is a guiding principle. Growth is what sets startups apart from other businesses. Ever wonder why people don't call restaurants startups? It's because most never escape their local market. Contrast that with Twitter. It is more broad in its appeal and relevance, thus can be scaled to a larger market. Startups offer big rewards, but also come with big risks. While a restuarant is only competing in a local market, businesses like Twitter, are competinng in a global market. When you make the commitment to start a startup, and in turn the commitment to grow that startup, you agree to the risk and hope for the reward. Once you begin, you can't slow down. If you you do, you give competitors a foothold and increase your risk. You should also be aware of the different players in the startup game: Founders, Investors, and Acquirers. I'll go into brief detail below on each player. The diagram illustrates how all three live and thrive because of each other. This is the first of many white board diagrams that I'll share. The purpose of the Investor is to help the founders succeed. In doing so, they make their own investment that much less risky. Of course, they are also using the startup as a means for financial gain. This brings us to our next player. While the Acquirer is a seldom talked about player in the startup game, they make all the headlines possible. The acquirer is in the game for a couple of reasons. First, to protect the status quo. Usually this means that the acquirer is in a similar business and is trying to protect it's place in the market by absorbing competitors. Second, they are looking to expand their business model and increase market share. By purchasing an already growing company, they can capitalize on this momentum to satisfy investors. There are other reasons behind aquisitions, but these are two of the most common. Finally, the last player- you and your team. Founders are at the heart of the idea and the business. Their goal is to solve a problem for themselves and for others. 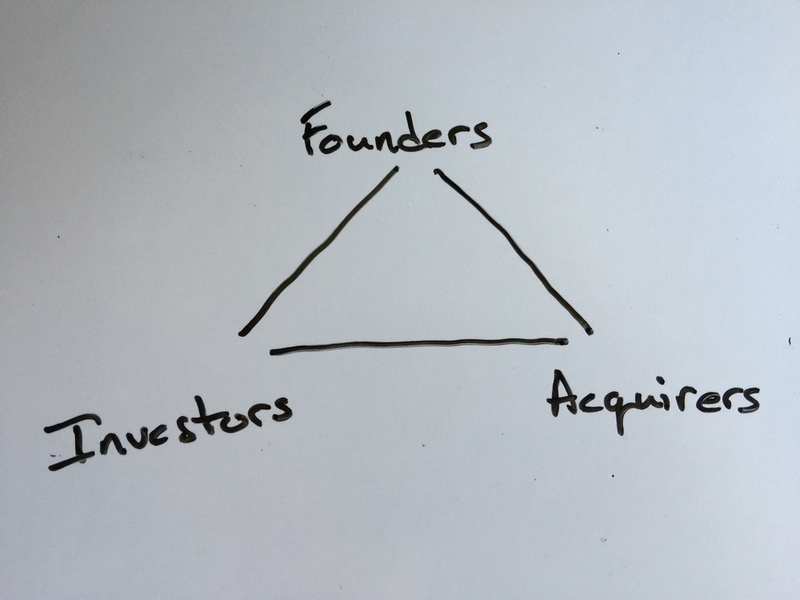 I put investors and acquirers on the bottom of the pyramid and the founder on the top, not because the founder is the best of the three, but because without the other two, the founder wouldn't be able to grow the startup. Each of these players are in some shape dependent on each other. Newer PostShould You Start a Startup?